Flash frozen just after being made, these ravioli are ready for a few brief minutes in boiling water. Is it really worth making your own pasta? That’s what we wanted to find out. So when we shipped staples up to our home in Point Hope this summer, we included a 25-pound bag of semolina flour and a CucinaPro manual pasta machine. And we eschewed buying the bags of dry pasta from Costco that have been standard in our kitchen for the past several years. The verdict? It’s definitely worth it, provided one has the time–which, happily, we do. That being said, with each batch of linguini or ravioli we turn out, we are becoming more efficient. Two sets of hands make the work easier and faster, and the pasta itself is amazing! The flavor is superior to store-bought dried pasta, it cooks up in a fraction of the time, and the variations one can create are limitless. 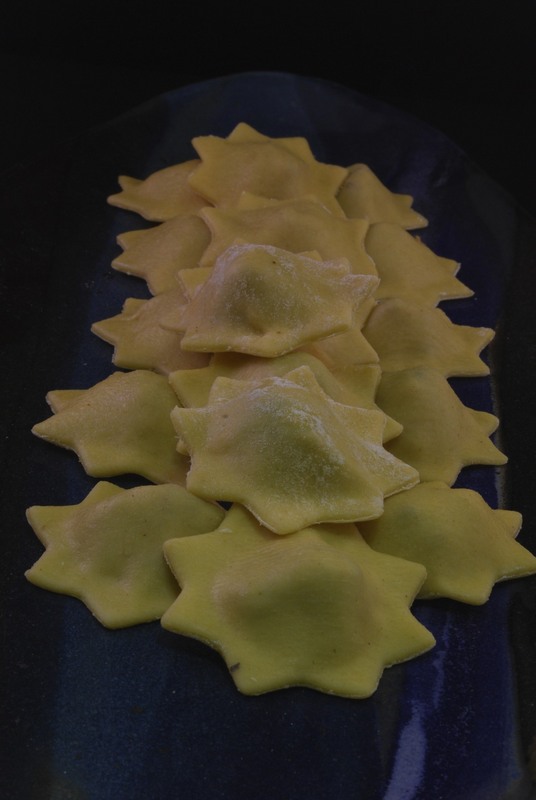 Below is a salmon-based ravioli filling we recently created. 1 tablespoon dried Italian seasoning. Morton & Bassett or Spice Hunter offer tasty mixes. 2. Combine chopped pine nuts, garlic and mushrooms in a small bowl and set aside. 4. Add remaining ingredients to the bowl. Use a fork to mix thoroughly, breaking up the salmon. Add additional olive oil, if needed, so that mixture holds together. Cover and place in refrigerator for an hour or more. 5. Use mixture as ravioli filling. 6. Serve ravioli with a lightly seasoned marinara sauce or with an olive oil topping, such as onions and sun dried tomatoes sautéed in olive oil. Finish with grated Parmesan cheese and perhaps a couple of grinds of black pepper. A Willamette Valley Pinot Noir would be the perfect complement. Another good choice would be Chardonnay.